Eating frequent fast food meals causes teens and young adults to gain more weight and face an increased risk of developing insulin resistance according to the results of a longitudinal study that followed over 3,000 young adults over a period of 15 years. Funded by the National Heart, Lung and Blood Institute (NHLBI) and published in The Lancet, subjects who ate at fast-food restaurants more than twice each week compared to less than once a week had gained an extra ten pounds and had a two-fold greater increase in insulin resistance, a risk factor for type 2 diabetes. Diabetes is a major risk factor for heart disease. Fast-food consumption has increased in the United States over the past three decades. On average Americans eat out 5.8 times a week. That's more than double the amount that showed increased risks for chronic disease in study participants, who were between the ages of 18 and 30. So what does this mean for your teen? It's time to get in the kitchen. Lead author of the study, Mark Periera, Ph.D., assistant professor of epidemiology at the University of Minnesota, explains why, “It’s extremely difficult to eat in a healthy way at a fast-food restaurant. 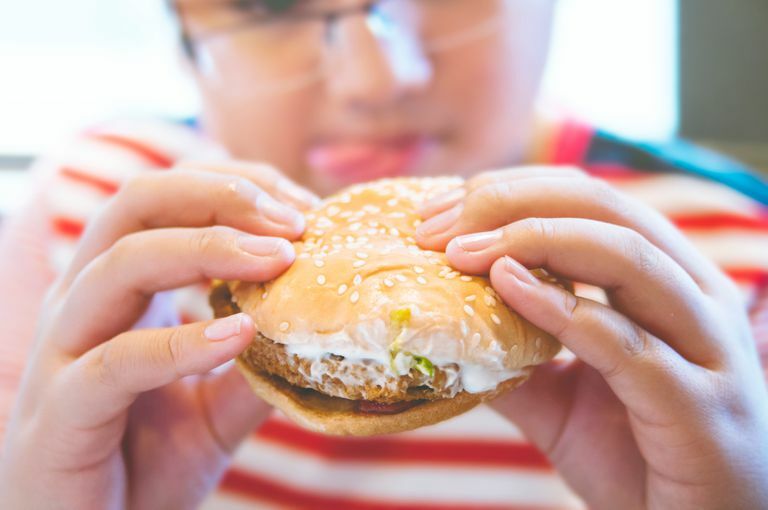 Despite some of their recent healthful offerings, the menus still tend to include foods high in fat, sugar and calories and low in fiber and nutrients.” The goal Pereira believes is cutting back on fast food intake, which means designating kitchen time for you and your teen. Even if you start with once a week, that's one less meal eating out, and that could save your teen some pounds. One reason for the weight gain teens experience due to eating out may be that a single meal from one of these restaurants often contains enough calories to satisfy a person’s caloric requirement for an entire day. Participants were asked during the physical examinations given as part of the study how often they ate breakfast, lunch or dinner at fast-food restaurants. The adverse impact on teens’ weight and insulin resistance was seen across all participants who ate frequently at fast-food restaurants, even after adjustment for other lifestyle habits. There are strategies to improving how you eat and they don't all involve cooking every meal in your home kitchen. For starters, know what's healthy on the menus of fast food restaurants. Many now offer salads, grilled as opposed to fried foods, and limited offerings of fresh fruit or yogurt. These options may be better than other dessert and staple items on the menu. Now that nutritional content is displayed on many fast food menus, designate certain meals on your OK to Eat list for certain fast food restaurants if you're in a bind. If you want to step it up a notch, before you are hungry, create a list of healthy fast food restaurants in your area and in the areas of where you work and practice hobbies. This go-to list will help you eat as healthy as you can when eating out. A great place to find a list of healthy fast food restaurants is through the Eat Real Campaign. If you must indulge, keep portion sizes small, and ask that high-fat sauces and condiments, such as salad dressing and mayonnaise, be “on the side” and use them sparingly to reduce calories. Mark Pereira, Alex I. Kartashov, Cara B. Ebbeling, Linda Van Horn, Martha L. Slattery, David R. Jacobs, Jr., David S. Ludwig. “Fast-food Habits, Weight Gain, and Insulin Resistance (The CARDIA Study): 15-Year Prospective Analysis”. The Lancet, January 1, 2005. Does My Teen Have Tourette's Syndrome? Should You Let Your Teenager Drink Coffee and Energy Drinks?